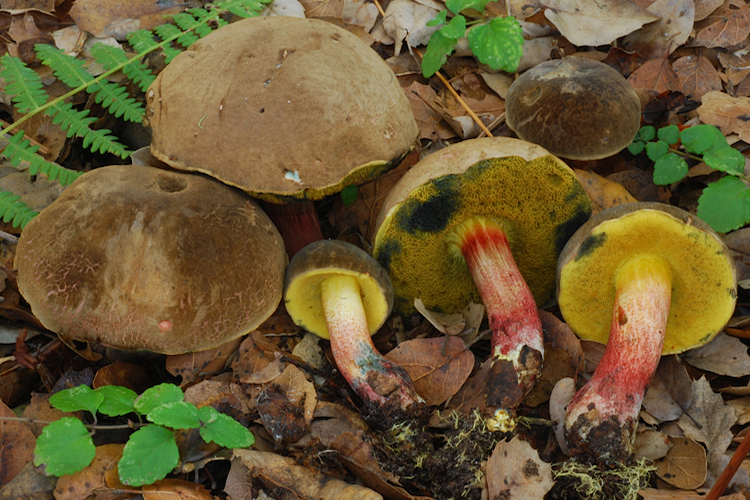 Xerocomellus is a genus of small to medium‐sized boletes with a characteristic color pattern: dark or dull caps, yellow pores, and red to yellowish‐red stipes. 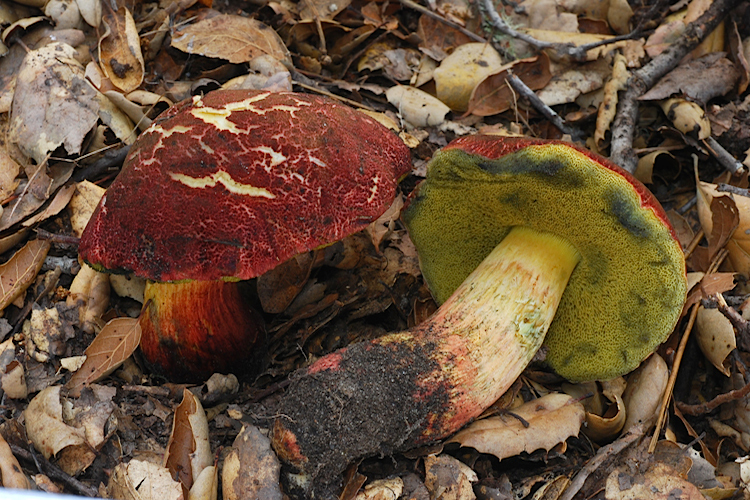 Two of the most familiar species develop cracking patterns on their caps, and are collectively called the “Cracked‐Cap Boletes”. 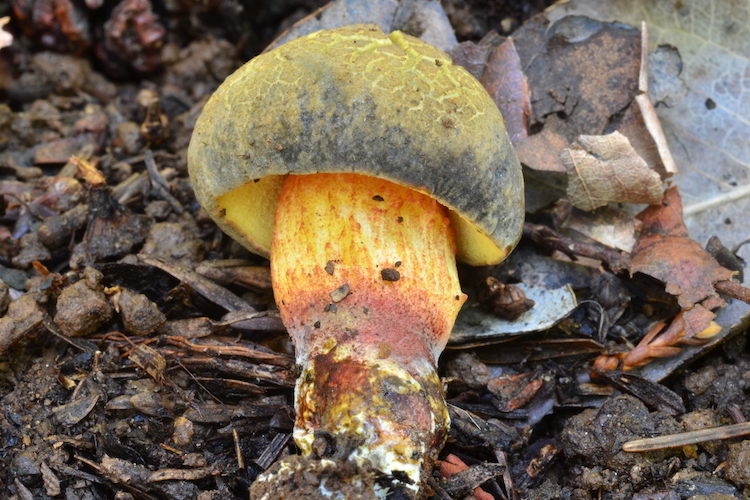 All are thought to be ectomycorrhizal (some species with hardwoods, others with conifers), but a few act like facultative saprotrophs, fruiting out of chunks of decaying wood or rotten logs. These mushrooms are among the most susceptible to Hypomyces infection in our area. Although all are thought to be edible, none are especially popular, partially due to their soft, mushy texture. Fruiting of species in this genus usually reach its peak in late fall and early winter. Identification can be easy (for specimens showing ‘typical’ combinations of characteristics), but is often very difficult due to the high degree of morphological variation within species as well as the degree of overlap in morphological characteristics between species. Be sure to note: Texture of the cap (this is perhaps the single most important character — felty‐fuzzy and cracking? Glabrous but strongly wrinkled? ), extent of red coloration on the stipe, degree of blue staining (or lack thereof) on the pores, and to a lesser extent, habitat association and biogeography. Microscopic data (size and shape of spores) are also helpful. 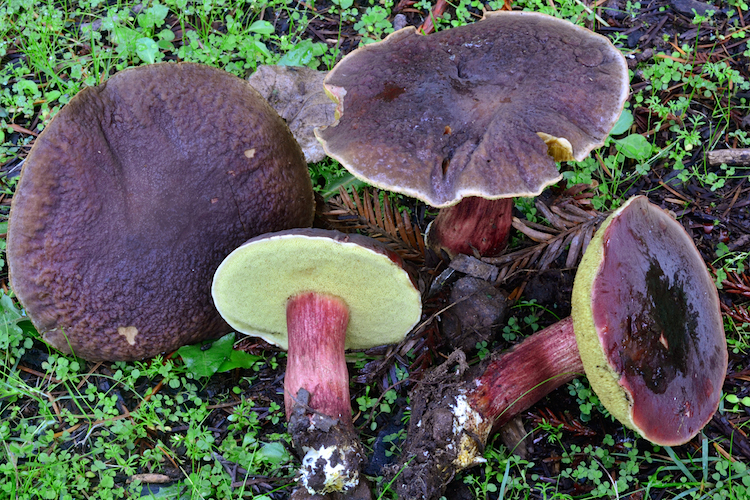 Comments — Many of these fungi were shuttled between Boletus and Xerocomus until recently. The establishment of Xerocomellus has precipitated a critical investigation that will soon result in the description of a few new species. Be prepared to get some new names for familiar species in the near future!